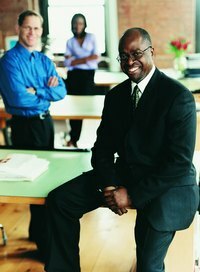 Celebrating a new boss sets a positive tone between the new supervisor, yourself and the other workers. While you must always respect professional boundaries, strict formality isn't necessary when welcoming a new boss to your team. Consider the company culture and the personality of the new boss when deciding how to welcome her. Incorporating silliness and humor in your welcome helps her feel included as a supervising member of the team instead of a disconnected higher-up. A humorous twist on a photograph shows you took time to research her interests. Call one of the references on her job application, if possible, and ask about her favorite television show or sports team. Explain the project to key individuals in her department and ask to take goofy head shots of each team member. Use a photo-editing program to paste the silly faces of individual staff members on to the bodies of players from her favorite sports team. You also could paste the faces of different staff members on a photo of a group of lions or colorful fish. Take a photo of your new boss sometime during her first week and include it in the project. Present her with a framed copy of the composite photo along with a welcoming card. Welcoming your new boss with practical jokes works well in laid-back office culture. Tie the practical jokes to necessary information such as the company directory. For example, place a spring-loaded snake inside her desk drawer with a copy of the company directory glued to its head. The snake head and company directory will leap upward toward her when she opens the drawer. Another option is hiding spring-loaded "welcome" signs of various sizes around her office, such as inside the filing cabinets, desk drawers or mini-blinds. Another option is attaching a comical noise-making device to her office door that plays bugles or trumpets each time she uses the door. Welcome your boss with a comical skit performed by various staff members. For the musically inclined office, create a song or musical dance number about things like the elevator is always broken or the windows don't open. Another option is to perform an overly dramatic, comedic skit about the idiosyncrasies of individual staff members. For example, have one line about Daniel, whose passion for weather updates has earned him the name, "the office forecaster." Another line could introduce Sarah, the sales receptionist, who loves summer so much that she wears cap-sleeved sweaters even in January. You could also perform a rap using different pieces of trivial information, such as which coffee machine works the best or parking attendant's favorite type of candy. Get permission from individuals featured in the skit before performing. Create a shared comedic experience between the staff and the new boss by inviting everyone to watch the skit together. Being the new boss is hard, especially in a close-knit office environment. Shared experiences and inside jokes reinforce your new boss' role as an outsider. Proactively address these awkward moments by explaining the major inside jokes in a book, story telling event or comic strip. Have everyone on the team tell an inside joke or ask a particularly artistic staff member to illustrate a few funny instances. Narrate events that everyone mentions at the holiday party, such as the time three members of the sales team continued closing a deal during a fire drill via conference call. Describe how their perseverance eventually resulted in a shouting match between themselves and the fireman. Always ask permission of featured individuals before compiling the stories.